If you haven’t heard by now, eating fat doesn’t necessarily make you fat. But too much sugar does. Ever since a doctor named Ancel Benjamin Keys conducted a large study in the 1950s showing that overconsumption of fat was contributing to the rise in heart disease happening at the time, American culture has been hooked on the idea that fat is bad, making everything else in comparison seemingly okay. We now know that the studies by Keys were flawed and that certain forms of naturally occurring dietary fat — such as those you might find in coconut oil, avocados, olive oil, nuts, and fatty fish — are actually good for you. One important distinction: Always go for fat from natural sources. Trans fats are created in a laboratory through a process called hydrogenation and should never be consumed. Trans fats are usually accompanied by the word “hydrogenated” and “partially-hydrogenated” on the ingredients list, and common sources include Crisco and margarine. Back to sugar. Couple the faulty studies on fats with an economic boom in the convenience foods industry in the ’90s and consumers were inundated with exciting new product labels featuring words like fat-free!, diet, 0 percent, heart-healthy, and other gimmicky marketing lingo. If you start looking more closely at your food labels, you’ll be amazed at where you’ll find incredibly high amounts of sugar — even in so-called “healthy” products. First, sugar is void of nutrients and crowds out other nutrient-dense food that your body needs to thrive. When you start your day with a Frappuccino or blueberry scone, you’ve missed the opportunity to eat (i.e., crowded-out) a nutrient-dense meal like eggs or a plant-based smoothie. And finally, excess sugar consumption can spike your blood sugar out of the normal healthy range setting off a cascade of insulin ups and downs — often referred to as the “high-glycemic rollercoaster” — which can cause you to feel even more hungry, have mood swings (hangry anyone?! ), store excess fat, and worse, lead to metabolic syndrome (aka pre-diabetes) and even Type 2 diabetes. 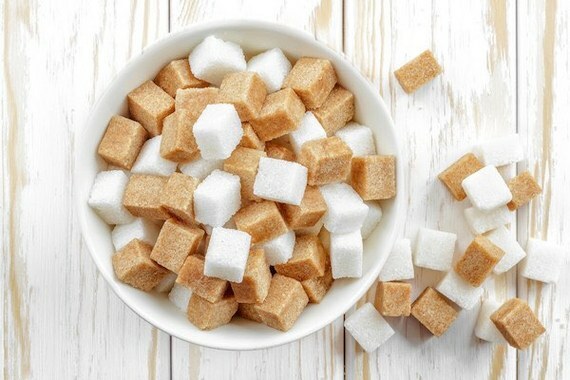 The World Health Organization recommends about 25 grams or less of added sugar a day. In comparison, a can of soda has about 40 grams and a typical store-bought granola bar has about 10-20 grams. So, if you’re snacking on something sweet more than once a day chances are that you are exceeding the recommended daily limit. 1. Drink more water, especially before snacking. Here’s an experiment to measure how much sugar you’re really eating: Write down everything you eat in a day, without judgment. Use the ingredient labels or Google estimates for how many grams of sugar each food has and add it up. If it’s over 25 there’s no need for outrage or self-criticism, just be a little more attentive the next day and keep trying to dial it back until your taste buds adjust and you find your sweet tooth satisfied with more whole foods and low-sugar recipes. This article originally appeared on ElizabethRider.com. Elizabeth Rider is a leading nutrition & whole living expert teaching women around the world how to become the healthiest, most successful people they know. Best known for her fun and accessible approach to food & healthy living, she’s built a seven-figure wellness business from scratch on her iPhone and laptop. In a world flooded with diet information, Elizabeth’s healthy recipes and straight-forward nutrition advice draw millions of inspired readers to her popular blog. Thousands have had success using her online programs, which include Clean Up Your Diet, Purpose To Profit and The Wellness Business Bootcamp. Elizabeth speaks on stages around the world and mentors scores of business owners each year to seek and live life on their own terms. As a Certified Holistic Health Coach (Integrative Nutrition) and accomplished online entrepreneur, cultivating a lifestyle of freedom and health is her religion. She is a TEDx speaker, regular contributor to The Huffington Post, and has been featured on MindBodyGreen, Shape.com, and The Daily Love among others. Join her on Facebook and Instagram (@elizabeth_rider) for healthy recipes & daily wellness inspirations.